The ground launched CJ-10 Long Sword is a strategic cruise missile modelled on the United States BGM-109G GLCM and Soviet RK-55 Relief, the latter both scrapped under treaty obligations. 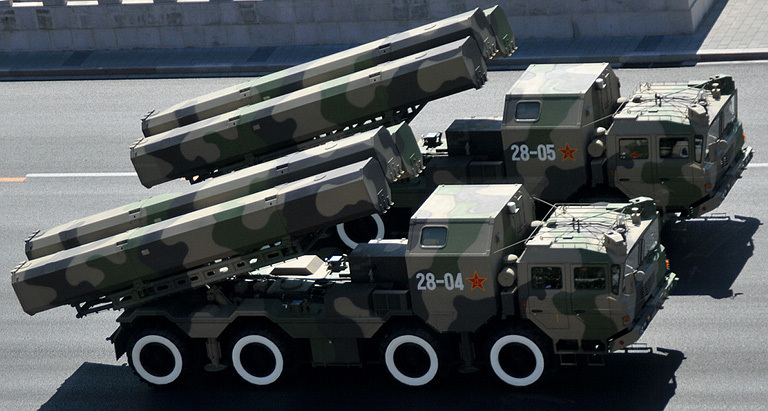 Chinese sources credit this missile with a range of up to 1,100 nautical miles. It carries a range of different 770 lb or 1,100 lb warheads. The PLA Second Artillery Force has currently up to 30 deployed TELs (Chinese internet). The PLA is a major user of cruise missile technology, and China both manufactures and exports a wide range of cruise missiles in all categories. 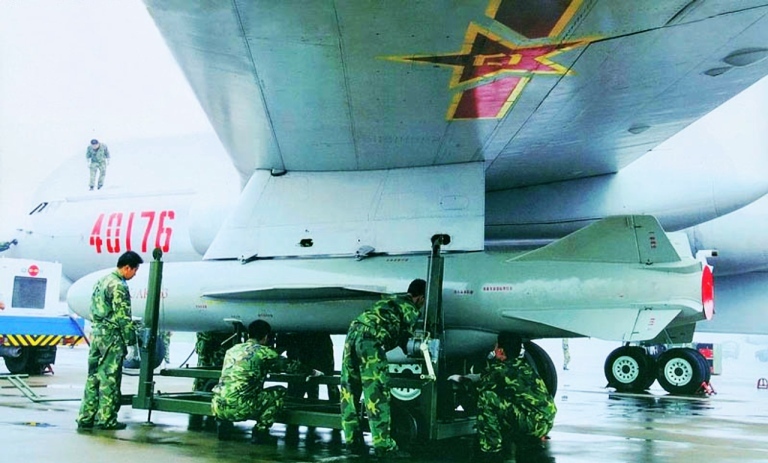 The PLA's preoccupation with cruise missiles reflects the historical reality that until the advent of the modern Su-30MKK/MK2 and FH-7 fighters, China lacked aircraft capable of penetrating any defences. 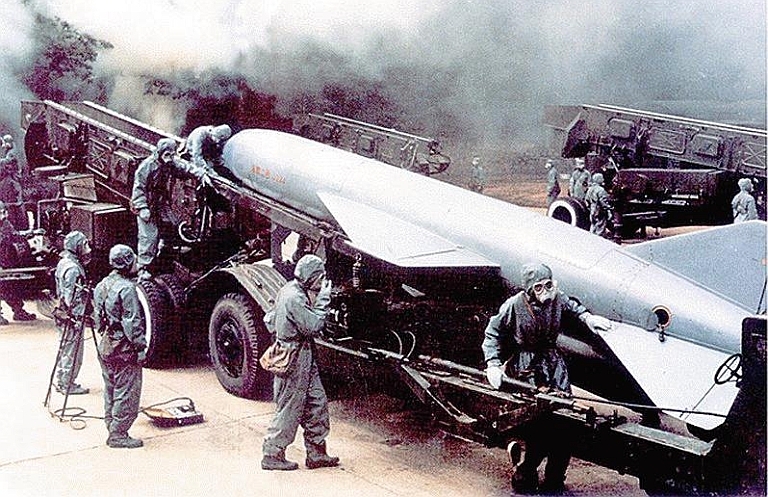 China's first generation of cruise missiles were based on the Soviet Styx, and derivatives of this 1950s design remain in production. 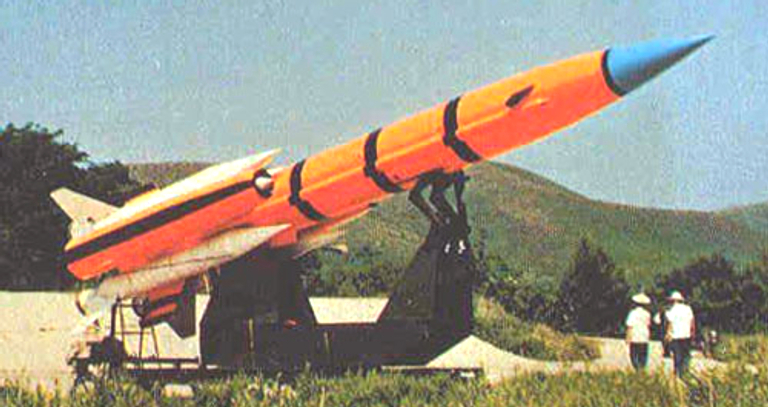 More recent Chinese designs are modelled on the Western Exocet, Harpoon and Tomahawk families of missiles. 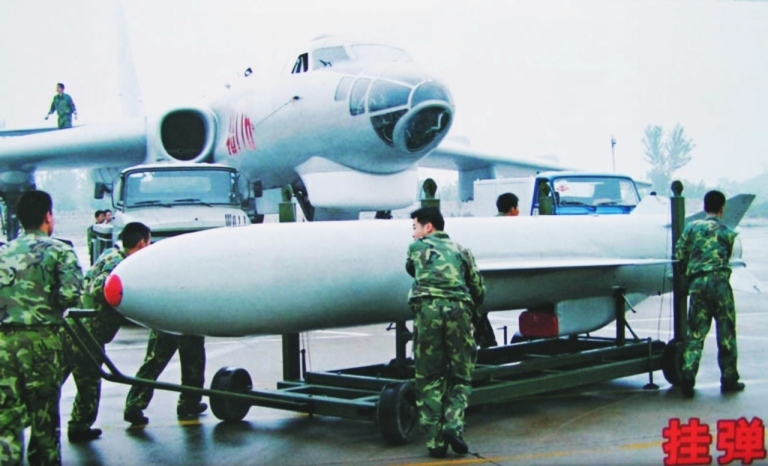 In addition to domestically built cruise missiles, China also operates the imported Russian supersonic 3M80E Moskit / SS-N-22 Sunburn, and the 3M54/3M14 Klub/Kalibr / SS-N-27 Sizzler missiles. 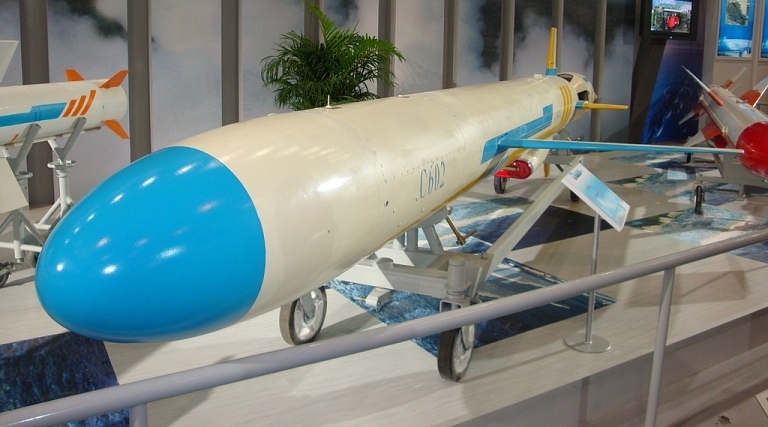 The C-101 is China's first indigenous supersonic cruise missile. 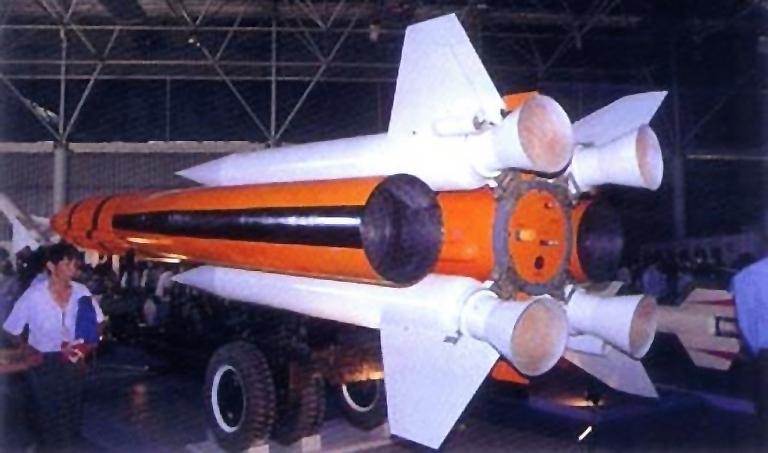 This design is analogous to Soviet first generation supersonic cruise missiles, but is a unique design employing ramjet propulsion in an arrangement most akin to the Bristol Bloodhound SAM. The missile uses a pair of jettisonable solid rocket boosters which accelerate it up to Mach 1.8. upon which the 180 kN ramjet sustainers are started and the missile accelerates up to its cruise speed of ~Mach 2.0. The sustainers are fuelled with 200 kg of aviation kerosene. The cruise altitude is programmed at 50 metres AMSL, and terminal closure to target from a distance of 5 km to impact is at 5 metres AMSL. Range is cited at 45 km. Two variants exist, one for air launch, the other for surface combatants. The pulse Doppler active radar seeker operates in the 2 centimetre band. A 300 kg semi-armour piercing warhead is employed. 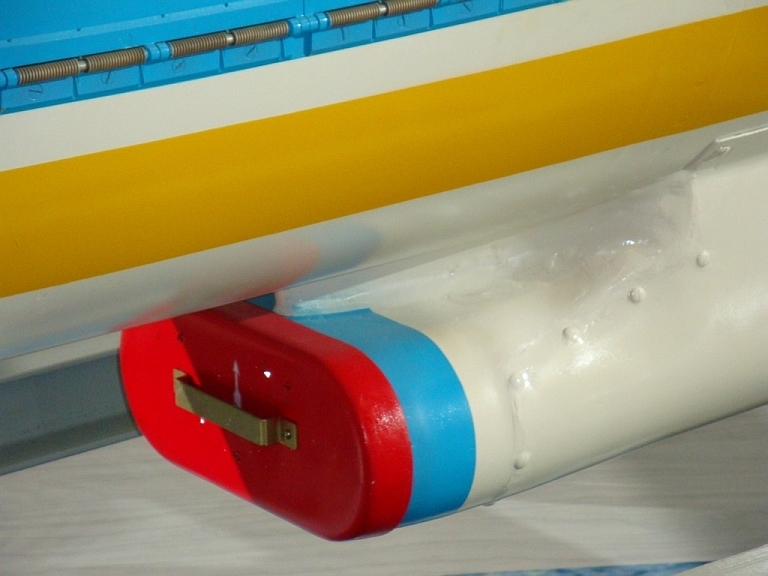 Hydraulically actuated canards are used for pitch control, and tail surfaces for roll and yaw control. An unusual feature are the dorsal and smaller ventral vertical stabiliser fins. 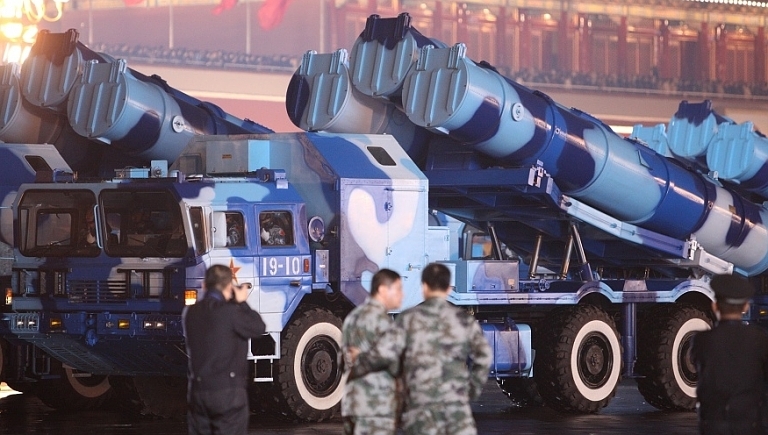 IOC was achieved during the 1990s, with the weapon used as a replacement for the HY-2 and YJ-6 while the PLA awaited the delivery of newer Russian missiles. The surface launched C-101 has been reported deployed on Heku/Komar class and other fast missile boats, the air launched variant on the H-6 Badger, H-5 Beagle and SH-5 LRMP. PLA warship launching an HY-1 missile. The HY-1 is a reverse engineered P-15 Termit / SS-N-2 Styx. Development of this clone commenced during the early 1960s, after the Sino-Soviet split, using samples of Soviet supplied weapons. The missile was eventually certified for production in 1974. The SY-1 is launched like the Styx from a tube launcher on a missile boat, the HY-1 from an elevating launcher on a turntable, either carried by warship or trailer in coastal battery variants. The missile is carried on Luda class DDGs and Jianghu class FFGs, as well as fast missile boats. The HY-1A is an improved variant with a more compact warhead and slightly increased fuel payload and range. While the Styx family of cruise missiles is widely regarded to be obsolete today, and too large and slow to penetrate modern defences on warships, the missile remains strategically important, due to its lethality and wide deployment. Used against transports, tankers, amphibious ships and other targets without defensive systems, the missile is highly lethal. Not only does it carry a large warhead, but the unburned hypergolic fuel produces considerable incendiary effect. PLA Silkworm (Styx) coastal defence battery. Fuelling up a HY-2 missile. The toxic and corrosive AK-20F/TG-02 propellant mix necessitates the use of chemical suits, a major operational encumbrance for this family of missiles. 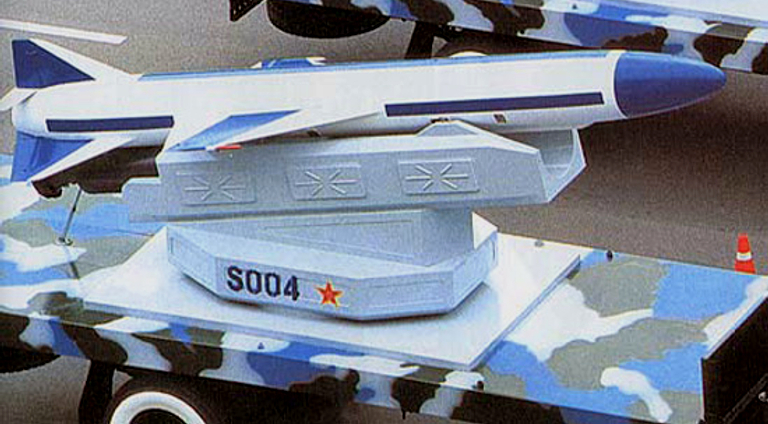 Commonly labelled as the “Silkworm”, the HY-2 Seersucker is a re-engineered and stretched HY-1 Silkworm, and remains one of China's most widely exported weapon systems. The ~1.5 metre fuselage extension provides ~700 kg larger fuel capacity than the Styx series, roughly doubling range to ~110 NMI. The weapon retains the 513 kg full fuselage diameter shaped charge warhead of the original Styx. The missile will cruise at 300 - 1,000 ft AMSL until its seeker acquires the target, upon which it descends to ~25 - 100 ft AMSL, depending on variant, for the terminal homing approach to the target. HY-2A - the conscan active radar seeker was replaced with a scanning infrared terminal seeker. HY-2B - the conscan active radar seeker was replaced with an improved monopulse seeker with better jam resistance and clutter rejection. HY-2C - the conscan active radar seeker was replaced with a television terminal seeker. 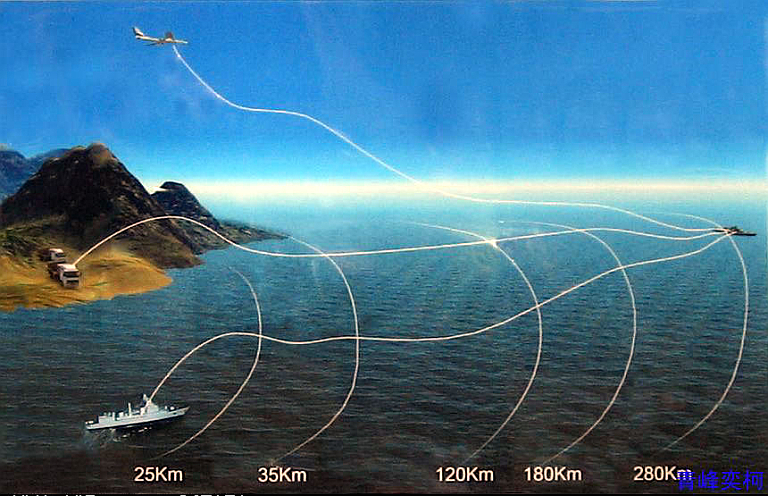 HY-2G - an improved radar altimeter was employed for more precise altitude control. HY-2J - variant exported to Iraq during the 1980s. The weapon is reported to have been exported to Egypt, Iraq, Iran, Albania, Zaire, Pakistan, Bangladesh, Myanmar, and North Korea, with the latter reported to have a manufacturing capability for the weapon. There are claims that Iran's HY-2s were supplied via North Korea. 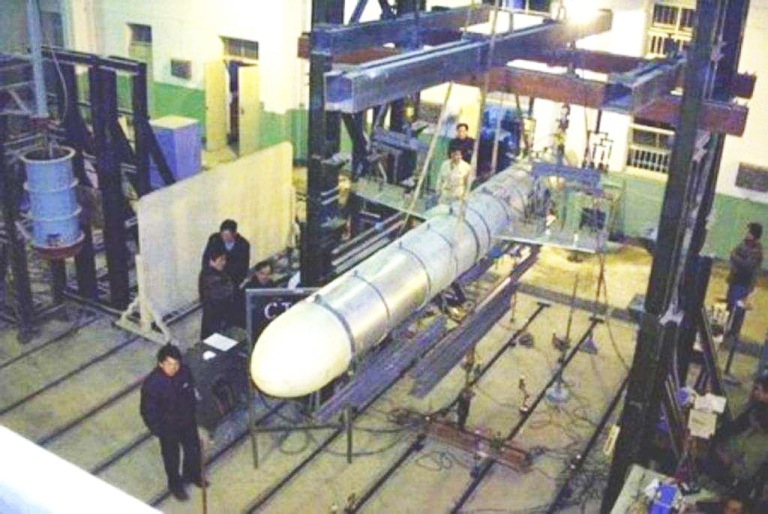 Numerous sources also claim Iran is manufacturing its own HY-2 missiles, using production plant supplied by the PRC. Late model HY-2J operated by the Baathist regime in Iraq, captured by Coalition forces. Note the access panels (US DoD). 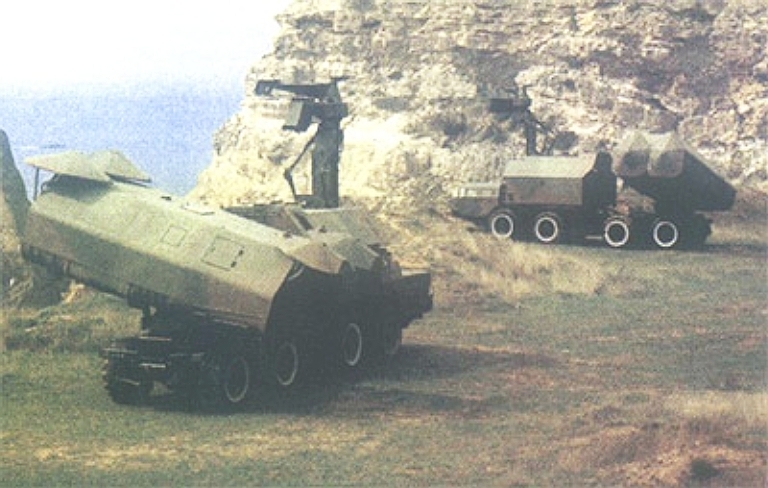 Iranian HY-2 coastal battery towed launcher (FARS). The SY-2 / CSS-N-5 Sabot is a solid rocket powered derivative of the Styx. It is readily distinguished by the cylindrical fuselage shape and pair of small horizontal surfaces at the base of the vertical stabiliser. The SY-2 is the replacement missile for the earlier SY-1 cloned Styx, intended for deployment from surface combatants and coastal batteries. While it is a Styx derivative, it is a substantial redesign with a solid propellant rocket motor rather than the cumbersome liquid propellant design of the Styx. It is often mislabelled in the literature as one of the two earlier liquid propellant variants. While the basic airframe configuration is the same, and the wings and anhedralled tail likely identical, the new fuselage is cylindrical but longer. Development of this weapon was initiated during the 1970s and IOC achieved during the 1990s. There are claims that the improved SY-2A has a turbojet powerplant, but little material is available on this weapon. The basic version has a cited range of 50 - 130 km. The SY-2 is deployed on a number of surface combatants previously armed with Styx variants. 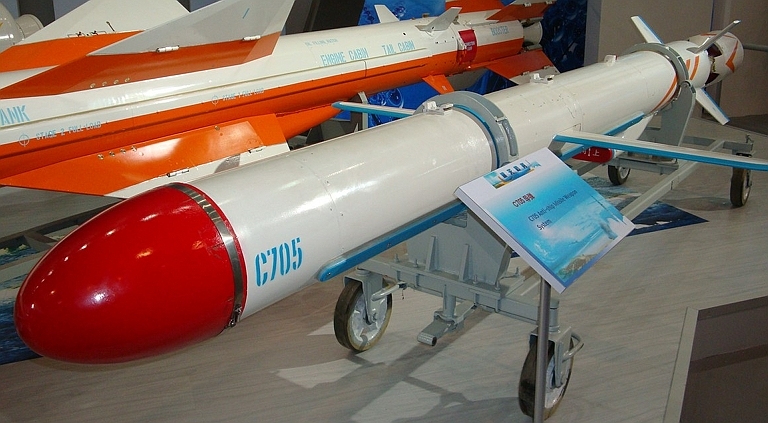 The export variant of this missile is the FL-2. This weapon is believed to have been exported to Iran, as pictures of it appear frequently on Iranian websites. 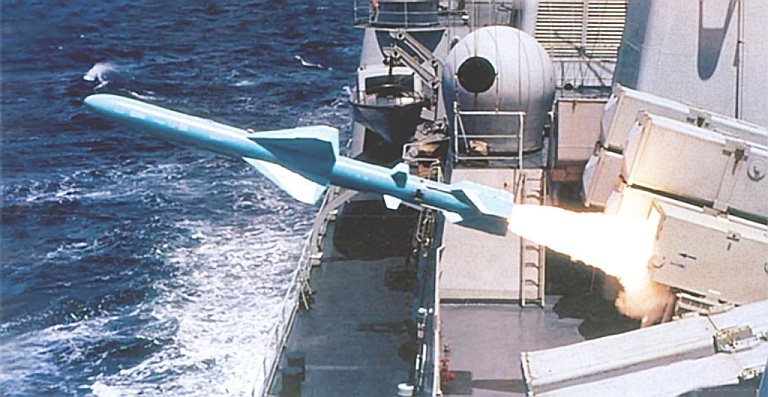 While the Styx family of cruise missiles is widely regarded to be obsolete today, and too large and slow to penetrate modern defences on warships, the missile remains strategically important, due to its lethality and wide deployment. Used against transports, tankers, amphibious ships and other targets without defensive systems, the missile is highly lethal. Display model of export FL-2 variant. FL-2 coastal battery self-propelled launcher of the PLA. Iranian FL-2 coastal battery self-propelled launcher (FARS). 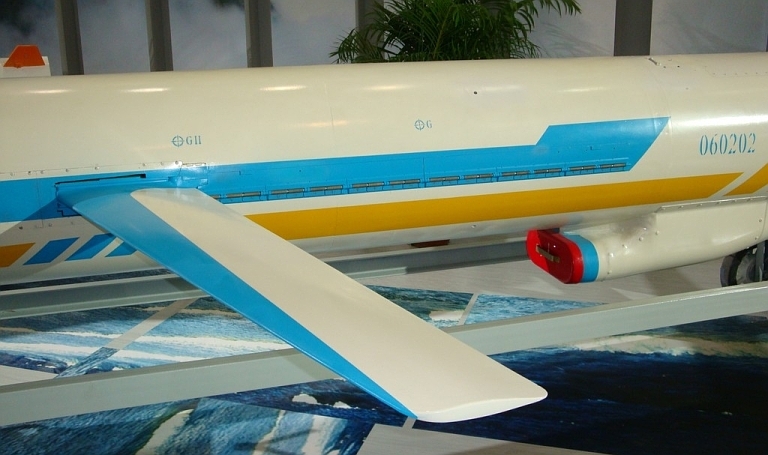 The C-201W / HY-4 / CSS-C-7 Sadsack is the first turbojet powered derivative of the Styx family of cruise missiles, and is a unique Chinese development. The engine is reported to be the WS-11 which is also used in some PLA UAVs. This design is a clone of the US Teledyne-Ryan CAE J69-T-41A engine, rated at 880 lbf at 22,600 rpm, used in the AQM-34 Firebee reconnaissance UAV, numerous examples of which strayed into Chinese airspace during the Vietnam conflict. The US engine itself a licenced version of the French Turbomeca Marbore. The HY-4 uses guidance components from later variants of the HY-2, and the basic configuration employs the common monopulse active radar seeker. The standard 512 kg shaped charge warhead is retained. Cited range performance is 135 - 150 km. The HY-41/XW-41 is an improved variant, with a cited range performance of 200 - 300 km. The HY-4 was exported during the 1990s. Iran is reported to have been a major recipient, with an indigenous variant now being publicly displayed. 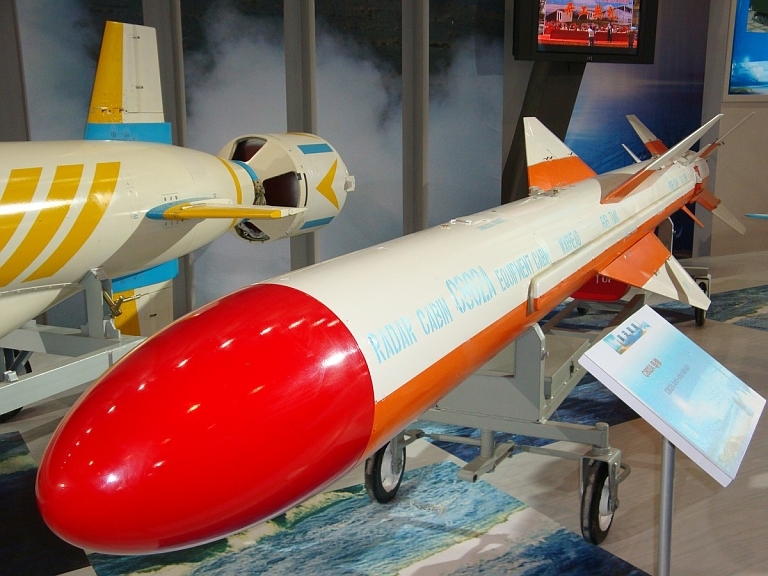 The stretched Raad cruise missile is claimed to have a range of 350 km / 190 NMI, and an indigenous DB-38 seeker. Export HY-4 have been marketed as the C-201W. The XW-41 is an improved HY-4. 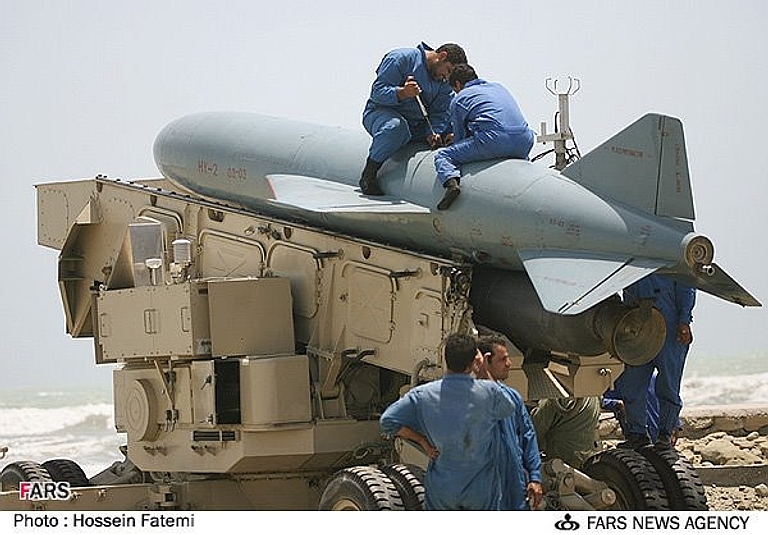 Iranian propaganda image of the Raad, a stretched and re-engineered HY-4 Sadsack cruise missile, with a claimed range of 350 km / 190 NMI, and an indigenous DB-38 seeker. 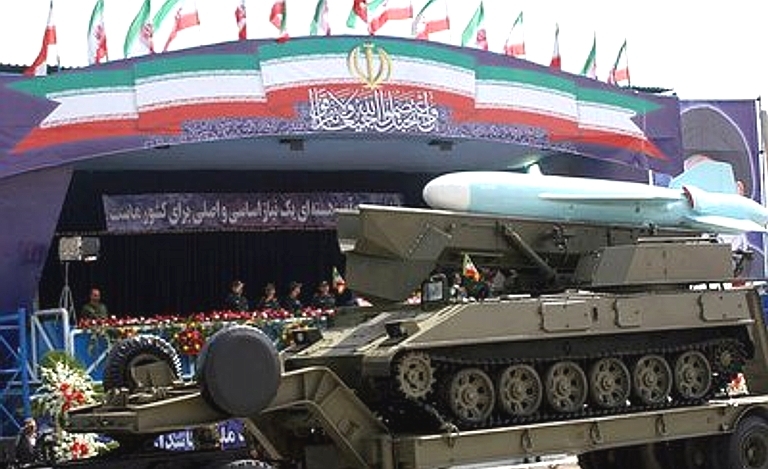 The self-propelled launcher is also of Iranian design. Note the dorsal inlets. 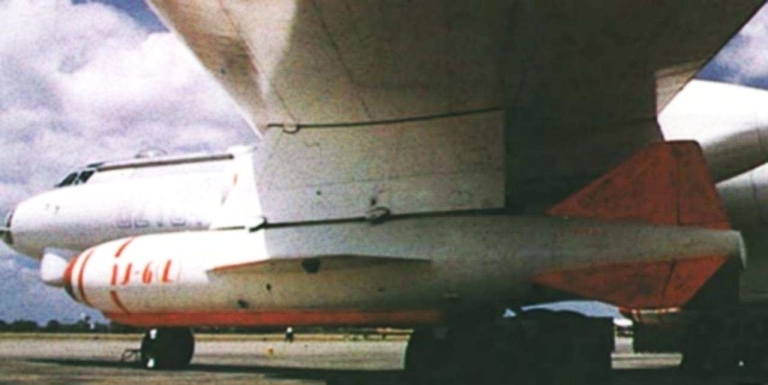 The C-301 is a Chinese analogue to the Russian Shaddock/Sandbox family of supersonic anti-ship cruise missiles, but employs ramjet rather than the turbojet propulsion used in the Russian designs. The missile is based on similar technology to the C-101, but is significantly faster, and claimed to be much longer ranging. The C-301 does not appear to have been deployed in significant numbers, and was only produced in the coastal defence variant due to its large size. 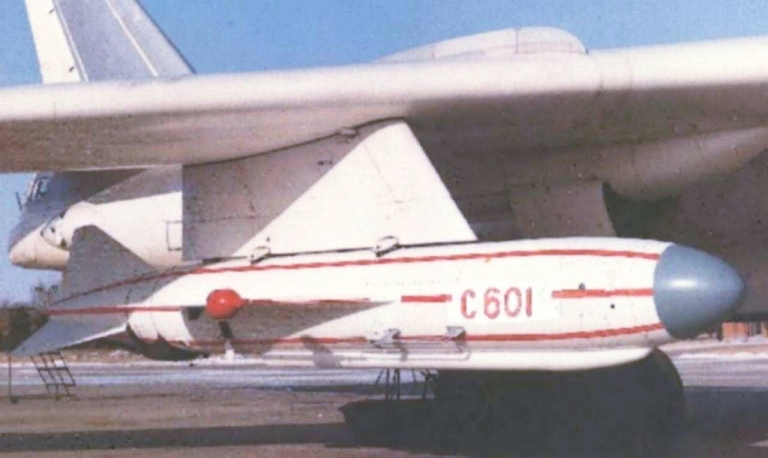 The CAS-1 Kraken series of missiles are air launched derivatives of the C-201/HY-2 / CSS-N-2 / CSS-C-3 Seersucker cruise missile. 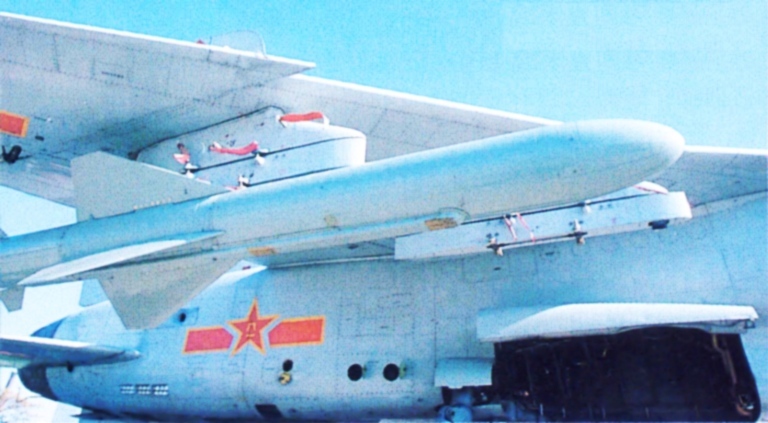 The basic weapon is in most respects identical to the HY-2, with necessary modifications for air launch such as dorsal hardpoints. 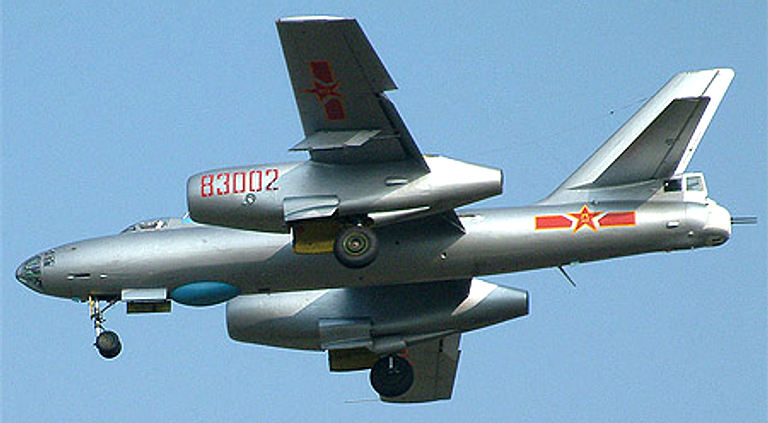 The Kraken is most frequently seen carried in pairs by the H-6D Badger variant operated by the PLA-N, and exported in small numbers to the Middle East. The H-6D is largely identical to the baseline H-6A/B variants, but is equipped with the Type 245 attack radar, itself based on the Soviet Square Tie fire control radar developed for the Styx armed Komar and Osa boats. 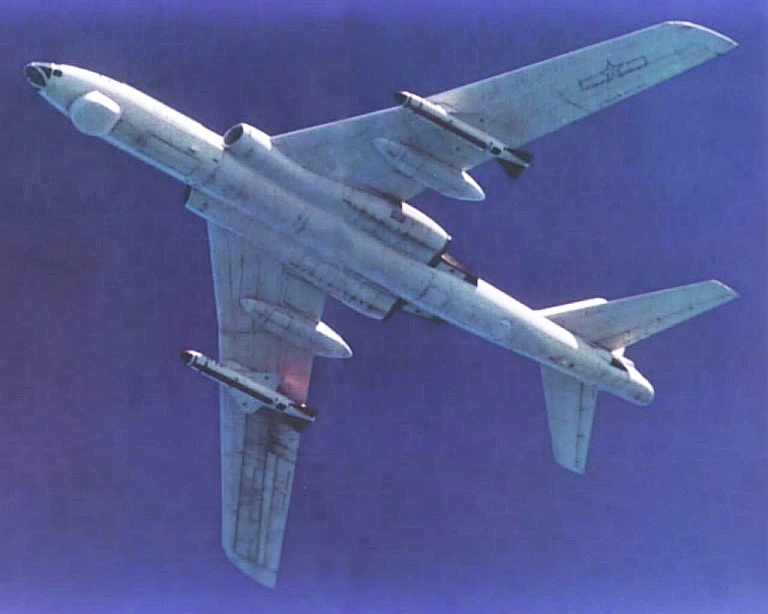 The Kraken has also been reported on the H-5 Beagle, which carries a single round. The YJ-61/C-611 is an improved variant. It has a slightly extended fuselage, and is claimed to use a higher energy density propellant mix and better engine design. Cited range for the YJ-6/C-601 is ~100 km, for the YJ-61/C-611 ~200 km. Terminal phase altitudes are cited at 50, 70 and 500 metres AMSL. H-5 Beagle of the PLA-AF. The recently revealed YJ-63/KD-63 is a derivative of the air-breathing HY-4 Sadsack. 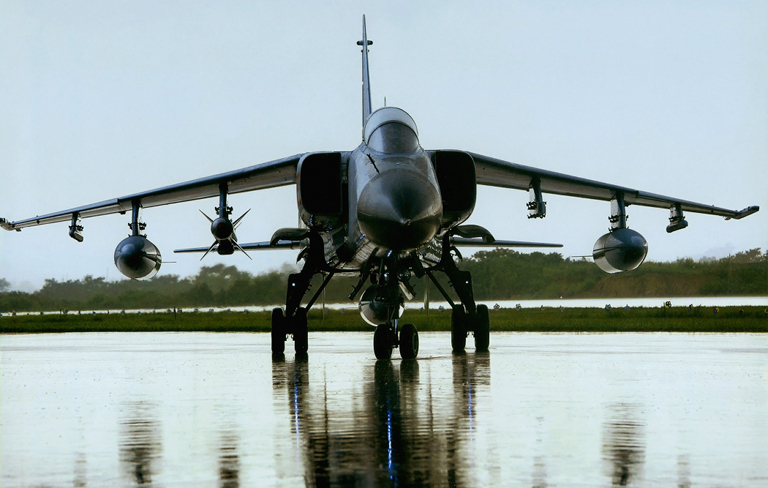 While it retains the delta wing and fuselage shape of the HY-4, it uses a new cruciform tail design, and includes a television / datalink terminal guidance package, with a reported satellite aided inertial midcourse guidance package. More recently images have emerged of a variant with a dielectric nose radome, equipped with a radar or anti-radiation seeker. It is thus a dual role weapon, capable of precision strikes against land and maritime targets. It is carried by the newly designed H-6H Badger variant, replacing the pair of CAS-1 Krakens carried by earlier variants. Range is cited at around 100 nautical miles. New Production Xian H-6H Badger. Launch of a 'Tomahawk-like' PLA-N YJ-62/C-602 cruise missile . 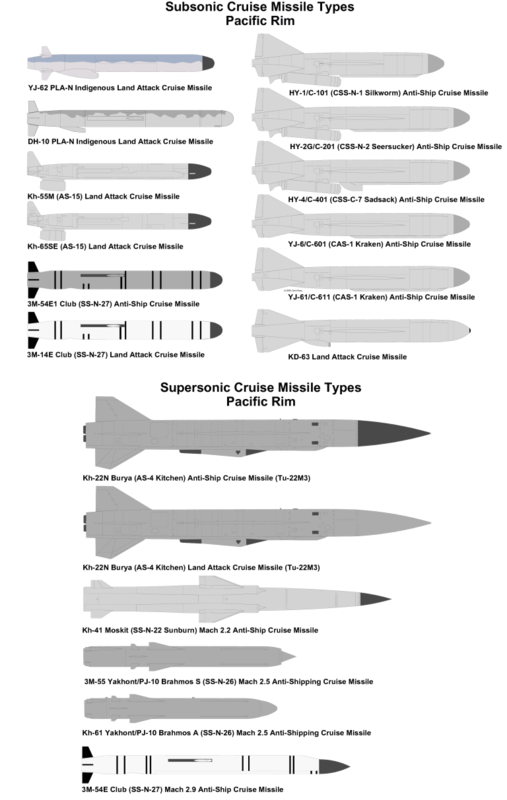 The YJ-62 cruise missile is a PLAN analogue to the anti-shipping variants of the RGM-109 Tomahawk/MRASM. The weapon has a similar general configuration to the Tomahawk family, but employs a unique fixed scoop inlet for the air breathing engine. Claims for this weapon include an active radar homing seeker with a monopulse antenna, GPS/Glonass/inertial midcourse guidance, alternate turbojet and turbofan engines, and ship, sub, coastal battery and air launch configurations. Cited specifications include a length of 6.1/7.0 metres, launch mass of 1,140/1,350 kg, warhead mass of 300 kg, cruise speed of 0.9 Mach, range for turbojet variant of 280 km / 150 NMI, and dual mode anti-ship and coastal target capability similar to later blocks of the Harpoon. The YJ-62 is claimed to have been deployed on the Type 052C Luyang II destroyer. Detail of YJ-62/C-602 cruise missile at Zhuhai 2008 (images © 2009, Zhenguan Studio). YJ-62 radome in test (CASIC). YJ-62 CONOPS diagram for baseline turbojet variant (CASIC). YJ-62 three round TEL on 8 x 8 vehicle (Chinese internet). 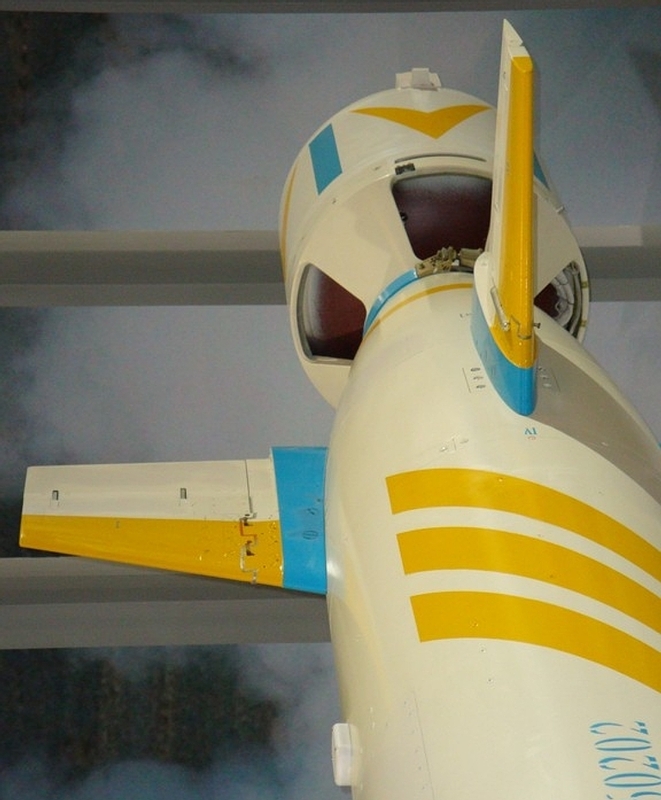 Above C-704 cruise missile with active radar seeker (images © 2009, Zhenguan Studio). The C-701 and C-704 missiles are analogues to the French Exocet family of missiles, available with a range of active radar and electro-optical terminal seekers. C-704KD Electro-Optical variants with gimballed TV and IIR seekers, at Zhuhai 2008. The IIR version uses a Magnesium Fluoride window (images © 2009, Zhenguan Studio). 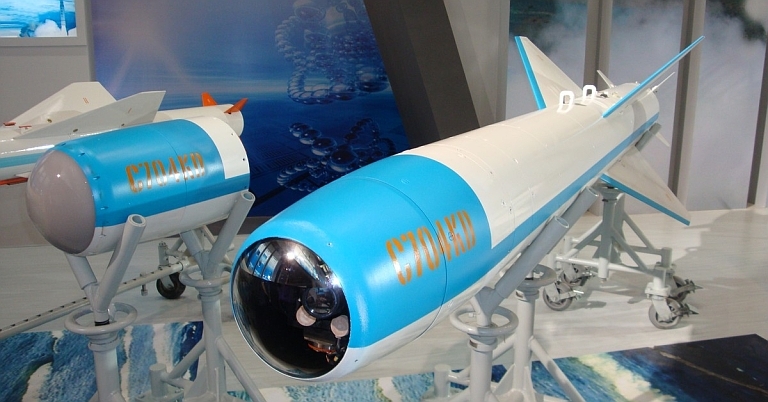 C-701 anti-ship cruise missile with active radar seeker displayed at Zhuhai 2008 (image © 2009, Zhenguan Studio). C-701KD variant with Electro-Optical seeker. The C-705 is a planar wing derivative of the C-701/704 family of weapons. It was first displayed at Zhuhai 2008 (image © 2009, Zhenguan Studio). 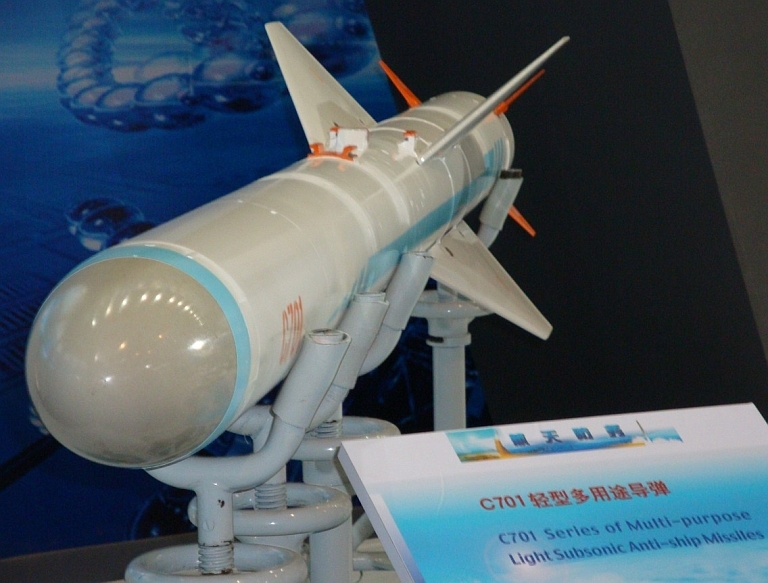 YJ-82/C-802A cruise missile at Zhuhai 2008 (image © 2009, Zhenguan Studio). 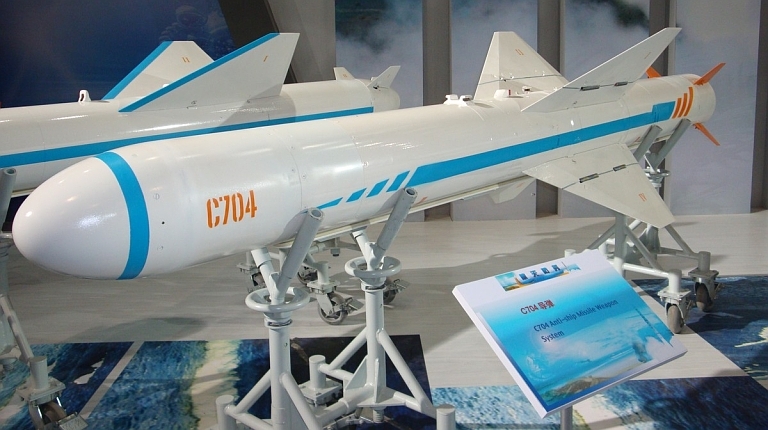 China's indigenous response to the Exocet and Harpoon lies in the YJ-8 (CSS-N-4 Sardine) family of missiles, available in ship, sub, land and air launch variants. The basic air launch rocket powered YJ-8K achieves 27 NMI (50 km) range, the improved YJ-81 cca 43 NMI (80 km), the turbojet YJ-82 (CSS-N-8 Saccade) cca 65 NMI (120 km), and the recently trialed YJ-83 variant around 135 NMI (250 km). These are the primary weapon of many PLA-N warships, and the FH-7 maritime fighter carrying four rounds. The most recent air launched variant is designated the KD-88. The most notable export of this weapon has been to Iran, who operate naval and coastal battery variants. 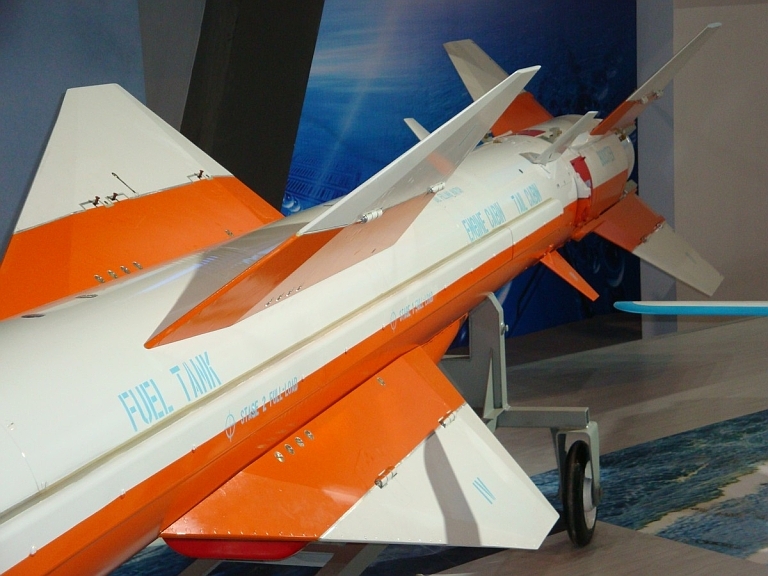 Aft view of YJ-82/C-802A cruise missile at Zhuhai 2008 (image © 2009, Zhenguan Studio). Air launched C-801K on FH-7 maritime strike fighter. 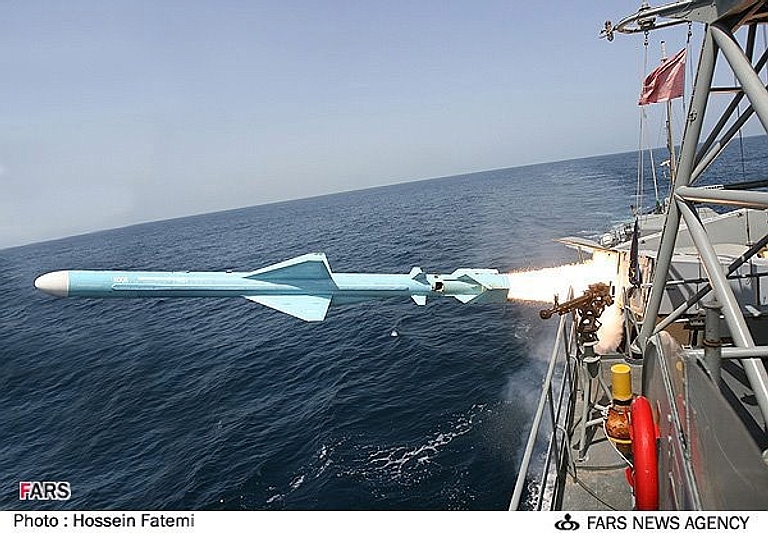 C-802 launch from an Iranian surface combatant (FARS). Iranian C-802 coastal battery launcher (FARS). KD-88 ASCM loaded on a JH-7 Flounder. KD-88 ASCM loading on a JH-7 Flounder. 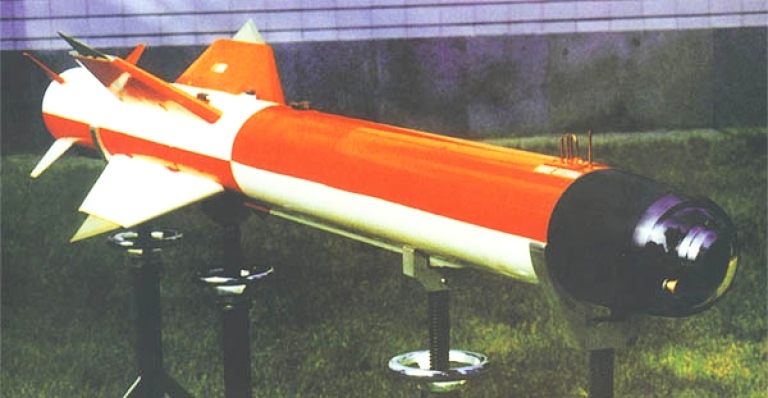 Undesignated PLA cruise missile, possibly a DH-10 or HN series prototype. China has had a long running program aimed at developing strategic land attack cruise missiles suitable for aerial, sub and ship deployment. Reports abound claiming the PRC has actively shopped the Middle East for debris from expended or failed Tomahawk rounds. More recently credible reports emerged claiming China has purchased tooling for the Raduga Kh-65SE, the reduced range export variant of the Kh-55 (AS-15 Kent) which is Russia's answer to the Boeing AGM-86B ALCM. There is also a wealth of documentary evidence covering a covert operation in which China procured from the Ukraine multiple Kh-55 rounds and test equipment. Many sources claim that the PLA now operates the indigenous HN-1 (320 NMI/600 km), HN-2 (800+ NMI/1,500+ km) and the HN-3 (1,350 NMI/2,500 km). The sole good quality image to emerge suggests these weapons are clones of the BGM-109 Tomahawk, suitable for naval and aerial launch. 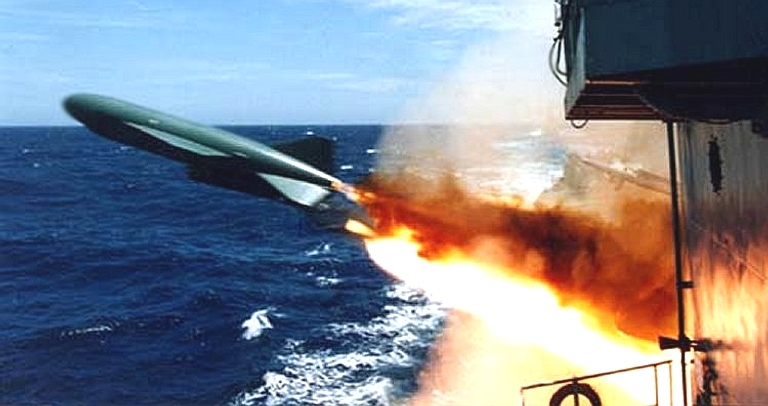 The CJ-10/DH-10 cruise missile, declared operational, also resembles a Tomahawk. Given the availability of Russian TERCOM, DSMAC, Glonass, Western GPS and computer technology, the only issue for the PLA will lie in good quality 12 inch 600 lb class turbofan availability to power a genuine AGM-86/BGM-109 class strategic cruise missile. With submarines, surface warships and H-6H Badgers, there is no shortage of launch platforms. The recently unveiled H-6H variant with four wing pylons is clearly intended for such a role. Chinese sources report the ground launched CJ-10 to be the GLCM variant of the DH-10 design, carried on a three round TEL (Chinese Internet). The Chang Jian (Long Sword) CJ-10 long range cruise missile system is reported to have started trials with the Second Artillery Force in 2004 and as of September 2009, between 50 and 250 missiles had been deployed along with between 20 and 30 launch vehicles. Their existence was initially revealed by Chinese media during the practice parade for 60th anniversary of the People’s Republic of China. 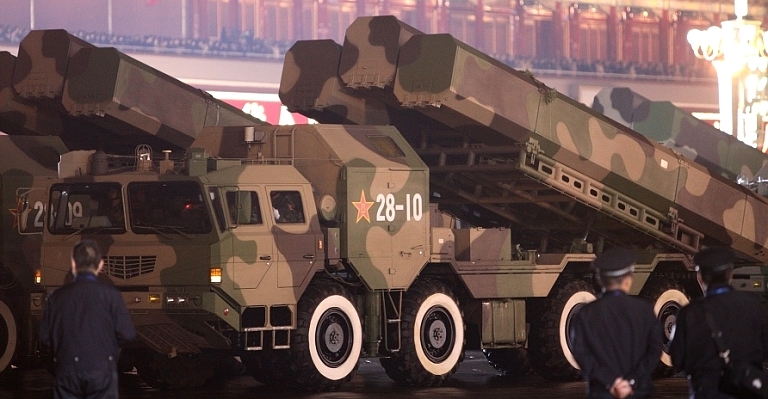 The system is identified by three long launch canisters, of octagonal cross section, mounted on the rear of the Chinese WS 2400 8 x 8 Transporter Erector Launcher (TEL), the missile has a reported range of over 1,500 km (~800 NMI) and up to 2,000 km (~1,100 NMI). Identified in the 2008 Annual Report to Congress Military Power of the People’s Republic of China as the DH-10, it is a land based derivative of the Kh-55/AS-15 Kent, at least six being illegally transferred in 2000 from the Ukraine to China. A Chinese article on the CJ-10 commented on Western military analysts comparing the CJ-10 to the defunct United States BGM-109G Gryphon, and its Soviet equivalent, the 3,000 km (~1,600 NMI) range RK-55 / SSC-X-4 ‘Slingshot’ which they claim was developed from the Kh-55 - this is only partly correct, insofar as the RK-55 Relief / SSC-4 Slingshot was derived from the naval S-10 / 3M-10 / RK-55 Granat / SS-N-21 Sampson airframe. It also discussed Western observers commenting on the illegal transfer of the Kh-55 and did not deny that, nor that the CJ-10 is based on the Kh-55. The missile uses both GLONASS and GPS satellite systems for guidance, with four different types of warheads available; a heavy variant weighing 500kg, and three 350kg variants: high explosive blast, submunition and earth penetrator. The WS2400 series 20 tonne 8 x 8 cross-country vehicles are for all intents and purposes copies of the Russian MAZ-543/7910 8 x 8 TEL, also used previously for the RK-55. When used as the TEL for the CJ-10, it is designated as the PHL-03 and has a maximum road speed of 60 km/hr with a maximum range of 650km using sealed roads. It can climb a 57% slope and cross water up to 1.1. metres deep. Compared to the defunct United States GLCM, the CJ-10 has one less missile, and the three missiles are in separate canisters following the Russian model, whereas on the GLCM system they were in a single quad-pack launcher. 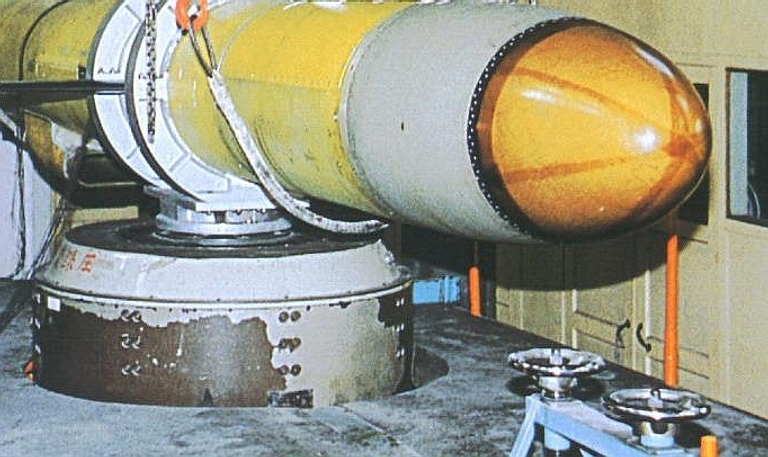 The Russian SSC-X-4 had six launch tubes on the same TEL so the number of CJ-10 launch canisters could be doubled to six without unusual difficulty. The CJ-10, along with the introduction of the YJ-62/C-602 dual-role long-range cruise missile and the satellite guided DF-15D Intermediate Range Ballistic Missile, is another reason why Russia would like to scrap the INF Treaty. ‘“Zhenmi zhishuai” zai puguang ___ Cong Guoqing 60 zhuonian Dayuebing kan jiefang dier paobing budui’, Tanke Zhuangjia Cheliang, 2009 Niandi,11 Qi, Zhongdi 295 Qi,pp. 22-25. Kopp, Carlo. 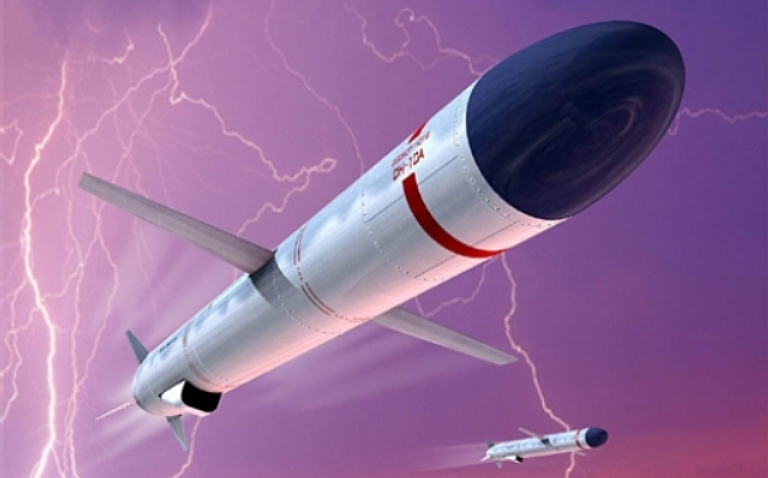 ‘Bypassing the NMD: China and the Cruise Missile Proliferation Problem’, International Assessment and Strategy Center, http://www.strategycenter.net/research/pubID.112/pub_detail.asp, 22 June 2006, accessed 10 February 2009. ‘Lingshou bian guojia “youlu zhongliang” ___ haiwai pojie Zhongguo CJ-10 luji xunhang daodan’, Tanke Zhuangjia Cheliang, 2009 Niandi,12 Qi, Zhongdi 297 Qi,pp. 15-18. Imagery Sources: US DoD, PLA, Manufacturers, Chinese Internet.